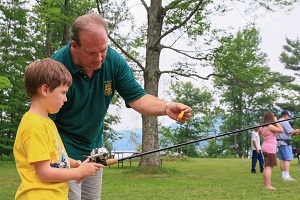 MONTPELIER, Vt. – Three state parks are working with the Vermont Fish & Wildlife Department to offer free Let’s Go Fishing clinics on a weekly basis this summer. Lake Bomoseen, Lake St. Catherine, and Boulder Beach State Parks will be offering these free clinics. The Let’s Go Fishing program is a network of trained volunteer instructors administered by the Vermont Fish & Wildlife Department who educate Vermonters and visitors of all ages and abilities about angling. Instructors teach fishing skills and techniques, the importance of quality aquatic habitat, fishing ethics, and fishing regulations. Clinics are free after paid admission to the state park and all equipment is provided on site. “Fishing is a fun group activity, and these guided weekly clinics make the learning process simple and enjoyable. We’ve had entire families come and learn together,” said Corey Hart, Education Specialist with Vermont Fish & Wildlife. 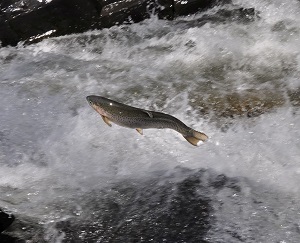 Vermont’s rural landscape and abundant waterways provide a variety of thriving fisheries, and fishing is an important part of the state’s culture and history. People looking to get into the sport can now learn to fish with expert guidance in some of Vermont’s most beautiful locations: state parks. Call (802) 584-3823 for park information. Call (802) 287-9158 for park information. 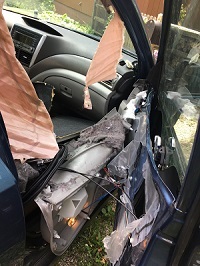 Call (802) 265-4242 for park information. No registration is required. Those taking the clinic are not required to possess a state fishing license during participation. Clinics are on-going now through August. 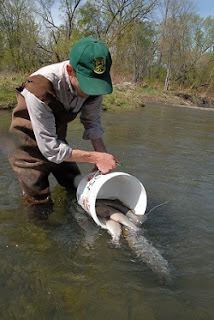 A complete list of Let’s Go Fishing opportunities is available at vtfishandwildlife.com. More information on Vermont State Parks can be found at vtstateparks.com.